Do you know why the 5-Star Single Door Refrigerators are considered as the best fridges to invest? Because, they are highly energy efficient, offering great savings on the power bills. 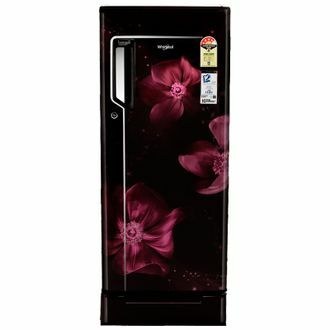 Check out this price list of 34 5-Star refrigerators with single door that has been updated on 23rd April 2019. The fridges in this range belong to popular brands like Whirlpool, LG, Samsung, Godrej, etc. The refrigerators come with features like humidity controller as well as reciprocating or smart inverter type compressor. Being rated with 5-stars, these units consume a bare minimum 230-volt power, with the consumption not being more than 300 watts in most of them. Get up to 5 years of warranty on the compressors of these units apart from the standard 1-year overall warranty. The best part is that despite being single door units, many of them have a high capacity of over 220 litres. The 5-star refrigerator price in India is different at different online stores. Only the smart will find out ways of saving an enormous amount of money on their monthly bills. So it's time for you to buy online a single door 5-star refrigerator and start saving on your energy bills, without compromising on the quality. The models are available with a plethora of online shopping websites like Croma, Amazon, and Flipkart. However, before you can delve into buying one from these websites, it is most recommended to look up at their specifications and find out which website is offering it at the lowest price.